I'm going to have to take issue with this view of 'signature' architects. No doubt its very true in the case of Frank Gehry's Guggenheim Museum in Bilbao, Spain. That project was really known for how it brought tourism to the area and really pumped up the local economy, just by being such a cool building. BUT... Thats one great commission from a great client with a huge budget. After doing 'the big one' the high profile architects get asked to do all sorts of smaller jobs all over the country and world, and each time the little clients think they're going to be the next Bilbao, but it just ain't so. We have a Maya Lin ampitheater, but there is little doubt in my mind that this is one of her 'lesser works' or perhaps a 'secondary design' of hers. If you were to rank her artistic achievements... Rosa Parks Circle isn't going to be anywhere near the top of the list. I don't see crowds of tourists crowding onto Monroe to see Maya's design. So GR bought a Maya Lyn, but if I didn't know it, I might have assumed it was done by a city engineer. These lesser "Me Too! I want a building by 'so and so' too!" projects often keep the designers office of interns busy, but generally don't receive a huge amount of "The Masters" time. There are some international projects whose situation is ripe for a really great star designer, but most are probably better off with local talent. You'd be amazed at how cool of building some designers in GR could come up with given the leeway, challenge, and the budget to do so. scenic and natural aspects of the river. No dates given yet. Also, it looks like the blue ped bridge is set to get a paint job. ugh... I mega-loathe Navy Pier. Thank Geebus for Millennium Park (Chicago's Gehry mee-too project BTW) which is quickly becoming the most popular tourist destination in Chicago. Is that such a bad thing? The City of Chicago spent oodles of cash on that project. Isn't it worth it being successful? I rather enjoy hanging around Grant Park and Millennium Park. Crown Fountain is one of the best people watching spots I've ever seen. As do I for many reasons, but Navy Pier does include much of what everyone has been saying they'd like to see downtown GR: small retail, dining of all kinds, entertainment, waterfront, etc. All with a flavor that somehow serves both local residents and convention visitors. My earlier comments re San Antonio and Navy Pier are only conversation starters. Neither does exactly what I think we'd need in GR. But both do have components worth studying. On the down side, Navy Pier is too much of a carnival atmosphere and SA is too dependent upon a warmer climate. I'd just like to make sure we don't end up with the "Rivertown Mall" version of a riverfront with nothing but chain-store-this and chain-eatery-that... all surrounded by a giant asphalt parking lot with numbers on the light poles. 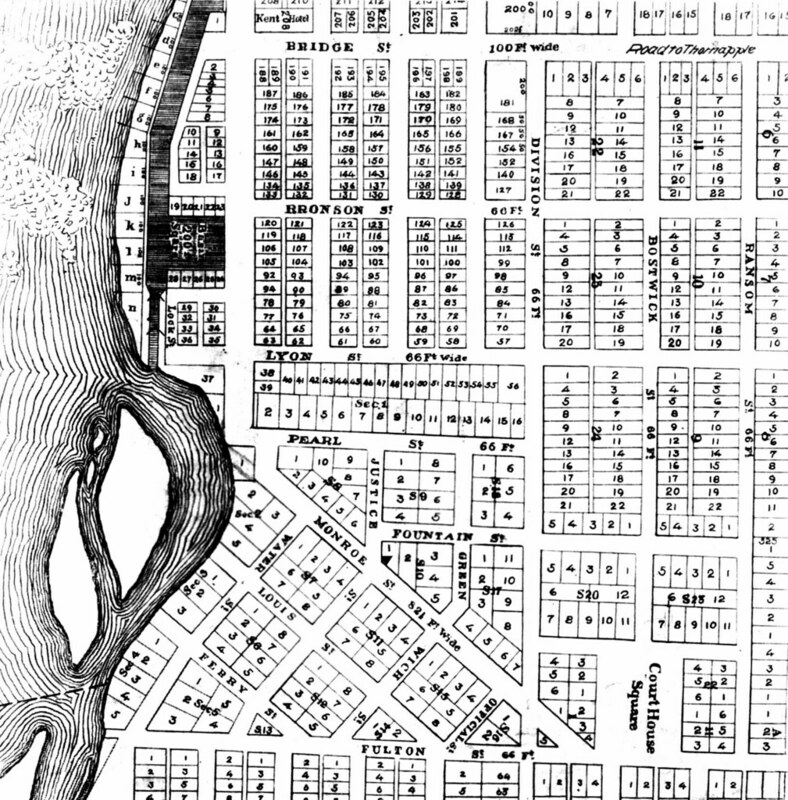 Well it is well known that the Grand used to be much wider than it is today, with Monroe basically travelling along the former line (and maybe even into the old river some.) With a wider river and smae amount of water flowing though, we had a much shallower river, which would allow for much grander rapids. What if we were to build an underground channel or pipe to help divert some of the water out of the river (and back into the river again further downstream) make the river shallower, thus allowing for rocks to be placed back into the river creating some rapids. Not that I'm saying this is practical, affordable, or anything of that sort, but it is a possibility (assuming organisations like the DNR would approve). Who knows, maybe 50 years from now such a thing could actually be probable? I can't go back in the aerial photos earlier than 1938 (after floodwall construction) to see what the river width downtown was. I can't believe the river would be much wider than say around Ada or Johnson Park today. It was "wider" downtown than it is today because there were canals down both sides to power the mills. (I can remember the one on the west side at the Voight mill although most of it was filled at that time). I would assume when the mills were running at capacity in the summer, there would have been very little water in the river itself. Aerial photos are unavailable but maps show that the river was twice as wide downtown as it is now. In fact, the JW sits atop what was once an island in the river I believe. I'm pretty sure there was another map somewhere which showed a larger area... I'm not sure where that was posted though. Sorry my comment was confusing. I was complementing MMPark:Chicago as infinitely better than Navy Pier. The mee-too remark referred to someone's earlier post who said those types of projects are never successful. As the most successful public/private civic partnership in recent history, it's a point MMPark clearly proves wrong. If you've never sat on the Great Lawn at the Pritzker Pavilion, or even Butler Field, you're missing one of the most fantastic views in the country. Reengineering the river to a "natural" state is probably not economically possible. I would rather we focus efforts on improving water quality than restoring any "rapids." Very good point - and a string argument for completing the remainder of the stormwater system. And even with the NKSA taking pressure off the GR sewer system, GR will probably still face the need to upgrade its system in the not so distant future. This is clearly where we should be planning to spend our dwindling financial resources. The greatest waterfront development in the world isn't going to succeed if the river is constantly filled with sewer overflows. But returning the river to it's natural state would probably improve the water quality. The dams in place actually add to the color of the river. The sixth street dam holds back the waterflow. Add in sunlight to mix with a slowdown in waterflow and natural sediments being carried from downstream will allow for more alge growth than if the river was freeflowing. Now compound the issue with fertilizer runoff from properties flanking the river. Even more food for the green stuff to grow on. As for my two cents worth, I actually like the development plans GR as doing currently with the Grand. I like the emphasis of putting the riverfront to recreational walks and parks over retail and commercial development. I remember being downtown in the mid-70's as a little lad, and that was a time where the river was truly being ignored. The 80's were the time where they started turning it around. Gillete bridge was coverted from auto traffic to a footbridge first, then the old rusting black railroad bridge was converted later to our lighted blue footbridge of today. (I can remember walking across the old railroad ties to cross the river back when the Ford Museum was dedicated. I actually bypassed the Secret Service pat down and screening that day by doing it! The fun things you could get away with back then as a young teen ) Beleive me when I say that in 20 years the river front has improve 1000%. To sum it up: Today you fish for trout, in the 70's it was carp. Sounds interesting. I'd love to hear what he says it would do to the river. I had a chance to talk to my dam expert today. Here's his thoughts: politically, probably not going to happen. He's been working on removing one from the Grand upsteam for 5 years and "all the parties' can't agree. Technologicaly, very possible. Cost :remove the dam approximately $1,000,000. Dredge clean sediment $1 - 2,000,000. Contaminated sediment??? depends on the contaminant. Streambed restoration - depends on what & where. He said a good ballpark number with contamination & restoration work $10,000,000. Say you were to do this with all the planets aligning, what would the river look like. Would it be wider or narrower? I heard the Grand used to get really wide in the Spring and then look really small and dumpy in the summer / fall with a large swatch of stinky river bed. Would this be the case? Uhhh, I don't like the sounds of that. Maybe that's why the dam was built, to better regulate a consistent width of the river in downtown? Plus, didn't someone here mention that digging up the contaminated sediment would send a toxic plume all the way to Lake Michigan? As long as efforts are made to greatly decrease contaminated runoff from getting into the river, and finish the sewer separation project, I think the river will be just fine. I don't know why more people don't boat on the Grand North of downtown. I think in front of The Boardwalk up to Riverside Park it's wide enough to even water ski (making wide turns), and definitely jet ski, and there's a boat launch at Riverside Park. The MSU water ski team practices and competes on a stretch of the Grand River West of downtown Lansing all the time, and it's much narrower. We used to hang out there during the summer in high school and watch the ski jump competitions. I don't know why more people don't boat on the Grand North of downtown. I think in front of The Boardwalk up to Riverside Park it's wide enough to even water ski (making wide turns), and definitely jet ski. The MSU water ski team practices and competes on a stretch of the Grand River West of downtown Lansing all the time, and it's much narrower. We used to hang out there during the summer in high school and watch the ski jump competitions. The dams were built to divert the water to the power canals on both sides of the river. The "pond" above the dams insured a steady flow of water even during the summer months. If the dams were removed, I'm guessing the river above Fulton Street to the end of the floodwalls would look like the river as it is today between Fulton & Wealthy. During high flow, it's wall to wall, duing low flow there's "sandy beaches". North of the floodwalls, it would look like the river from Knapp Street (way upstream East of Grand River Drive) to Ada or the area near Johnson Park. More fisherman use the river via boats than recreational boaters. I'm not sure I'm ready for full body contact watersking . Remember Lansing & Jackson haven't done much to eliminate their sewage overflows. The water quality there is worse than GR in my opinion. My daughter competed in a canoe competition in Lansing by the river boat and that water was gross I jetskied on it from Leonard Street to Ada last year but didn't go swimming Even when there hasn't been any over flows, theres a lot of natural sediment that is in suspension. As for contaminated sediments behind the dam, soil samples are taken and the sediemnt is treated for those contaminates. It just isn't let go to flow down river. Do we have accurate number of how deep the Grand is in the stretch you mentioned? Any unknown/unmarked submerged trees? That's why I personally wouldn't venture into the river to water ski. Well that was my point, the water skiers in Lansing didn't seem to have a problem with it, and they were downstream of downtown Lansing where overflows would go. And if most of GR's overflows happen South of Wealthy, what would be the harm in boating/skiing North of the dam? Is there any city upstream of Grand Rapids discharging (Ada, Portland, Lowell, Grand Ledge? other than Lansing?) I know Jonathan Rooks has seriously looked at putting in slips in front of The Boardwalk. grrwymng, about 7 years ago or so I watched "Thunder on the Grand" near Riverside Park. These guys were racing in modified jet powered boats going over 100 mph on the river through that area. They only had to delay the race once when there was a log or something in the way. I think it's a perception issue that the river in non-navigable. Depth of the river depends on the time of year:) Late spring early summer is deeper than late summer especially if it's been dry. Having said that in mid summer it's probably 2-3 feet, maybe 1-1.5 deeper in the channel. Mid-August I watched a fisherman walk across the river at Knapp Strret (east) and not get his knees wet. It was a little deeper in the channel along the west shore but not to his waist. There was a couple spots upstream of there that I had to find the channel to have sufficient water for the jetski. My marine charts indicate the similar depths down near Grand Haven except for the marked navigation channel. The water is deeper from say the Whitecaps down to 6th Street. My 23 foot Searay draws 30 inches with the I/O drive down. I'd be comfortable running it below the Whitecaps but not above. Even below I-96 I'd run about 4 passes at slow speed with my depth finder to plot the river depth before I'd open it up to full throttle. PS: If I'm trailering my boat and putting it in the Grand River, I'm going to put it in in Grand haven That's probably why you don't see more boats at Riverside park. As for stumps or hidden logs - I always make a run upstream at half throttle with my jetski just to look for logs. Last summer, there was only one downstream of Jupiter and it was marked with a buoy. The water is not really deep enough to cover the logs. If it does, you can spot an eddy or ripple that tips you off. In the 70's, it was brown trout, the kind you find at 1300 Market SW, not a fish store . If you don't remember those days, let me assure you the river is tremendously cleaner today, even after an overflow.